The 1940 Blitz, when Hitler tried to bomb Britain in submission, is often viewed as a time of common heroism. British civilians refused to panic, came together across social lines, and kept their stiff upper lip, while keeping calm and carrying on in the face of terror and random death stalking them from the skies. Britons, particularly the Londoners whose city was the German bombers’ main target, toughed it out, and went about their daily lives while maintaining a remarkable level of normalcy in the midst of daily devastation and havoc. However, the reality was more complex. There was plenty of stiff upper lip and keeping calm and carrying on, and no shortage of everyday courage and heroism. 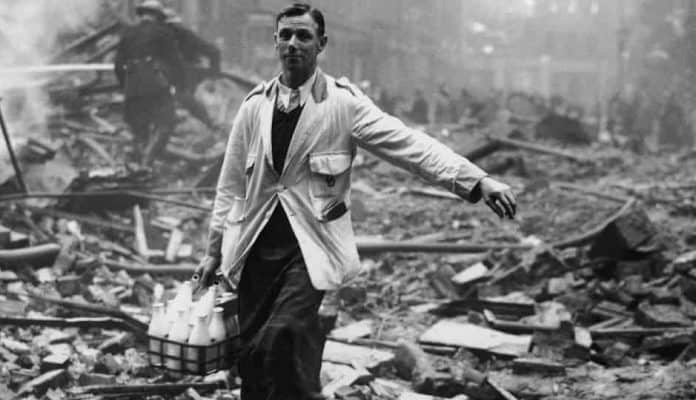 Given the dire circumstances, Londoners were, indeed, remarkably resilient. However, there was also no shortage of anxiety and panic. And contra the common held perception of social equality in the face of a common foe, the misery of the Blitz was not equally shared: it fell heaviest upon the poorest Londoners, particularly those in the East End. Nonetheless, the experience did end up drawing the classes closer, mostly by changing the upper classes’ perceptions of the lower ones. In May of 1940, the Germans sprang their blitzkrieg on the Western Powers, to devastating effect. Within six weeks, they rolled over the Low Countries, crushed France, and chased the British out of Europe. Hitler figured that the war in the west was all but over, and that a chastened Britain, realizing that its situation was hopeless, would soon sue for peace. He was willing to be generous, as he defined the term, and allow the British to keep their empire, in exchange for recognition of German supremacy on the European continent. To the annoyance of the Fuhrer, the British failed to see things his way. Instead, under the leadership of the pugnacious Winston Churchill, and buoyed up by their Prime Minister’s defiant rhetoric, the British geared up for a protracted fight. Reluctantly, Hitler ordered plans for an invasion of Britain, codenamed Operation Sea Lion. A prerequisite for Sea Lion’s success was German mastery of the skies over southern England, and the German bid to secure that aerial supremacy led to the Battle of Britain, July 10th to October 31st, 1940. The Luftwaffe came close to winning, but just when it had the Royal Air Force on the ropes, fate intervened to save the defenders – and trigger the London Blitz. On the night of August 24th, some German bombers flew off course, and accidentally bombed London. Churchill interpreted that as deliberate, and the following night, 40 RAF bombers struck Berlin in retaliation. That incensed the Fuhrer, who was already frustrated with the failure of his airmen to subdue the British, and prompted him to redirect the German effort from crushing the RAF, to crushing British morale and terrorizing Britain into submission. The Luftwaffe began delivering on Hitler’s vow three days later, with its main focus being London, which was struck with a major raid on September 7th. At around 4 PM that day, about 350 German bombers, escorted by over 600 fighters, blasted the British capital in a raid that lasted until 6 PM. Two hours later, a second wave of bombers, guided to London by the fires set by the first raiders, worked the city over some more, wreaking havoc until 4:30 the next morning. It was just the start of the London Blitz, and for the next 57 days, the city was bombed either during the day or night, and sometimes both.